Latin-American Squad Training with Greg McDonough and Kathryn Jones. 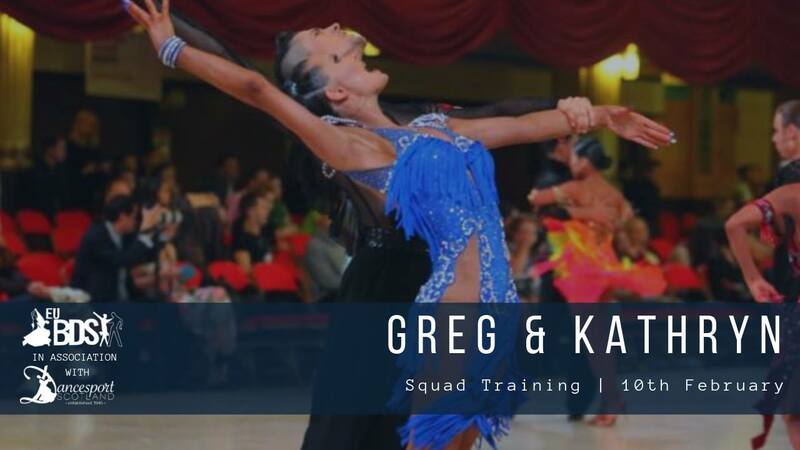 Dancesport Scotland in association with Edinburgh University Ballroom Dancing Society are very excited to invite DS members to two Latin workshops with British and UK Closed Professional Finalists, Greg McDonough and Kathryn Jones. The workshops will be held on 10th February 2019 which will cover separate dances, and can be attended independently. All are welcome, and no partner is required. Admission is free for DS members, £5 for non-members and £3.50 for EUBDS members. (DS membership forms may be found here. Food and a bar are available at the venue. Tea Dance at the Bowhouse Community Centre on Saturday, 10th November 2018. Dancesport Scotland would like to invite you to an evening of dancing at the Bowhouse Community Centre. Members and non-members of Dancesport Scotland are equally welcome to enjoy lots of dancing, great music, brilliant atmosphere and of course a cuppa in the tea break. See below poster for more details. Afternoon Tea Dance at the Bowhouse Community Centre on Saturday, 18th August 2018. Dancesport Scotland would like to invite you to an afternoon of dancing at the Bowhouse Community Centre. Members and non-members of Dancesport Scotland are equally welcome to enjoy lots of dancing, great music, brilliant atmosphere and of course a cuppa in the tea break. Sunday Afternoon Dance at the Bowhouse Community Centre on 27th May 2018, 1.30pm - 4.30pm. Dancesport Scotland would like to invite you to an afternoon of dancing at the Bowhouse Community Centre. Members and non-members of Dancesport Scotland are equally welcome to enjoy lots of dancing, great music, brilliant atmosphere and of course a cup of tea in the tea break. Entry for Dancesport Scotland Members £1 per person, general public £4 per person. For more details visit our Facebook page.